Prototype: Swiss Federal Railways (SBB) class Re 4/4 II electric locomotive as the class Re 420. Red basic paint scheme, with a promotional design. Three (3) type Kps two-axle flat cars in a brown/black basic paint scheme. All of the flat cars are with circus wagons. The train looks as it did in 2018. Model: The locomotive has an mfx+ digital decoder and extensive sound functions. It also has controlled high-efficiency propulsion. 2 axles powered. Traction tires. The triple headlights and one (1) white marker light (Swiss headlight / marker light code) change over with the direction of travel, will work in conventional operation, and can be controlled digitally. The light code can be switched to a red marker light when the locomotive is running "light". The headlights at Locomotive End 2 and 1 can be turned off separately in digital operation. When the headlights are off at both ends, then the double "A" light function is on as a red emergency stop light. Warm white and red LEDs are used for the lighting. The locomotive has separately applied metal grab irons. 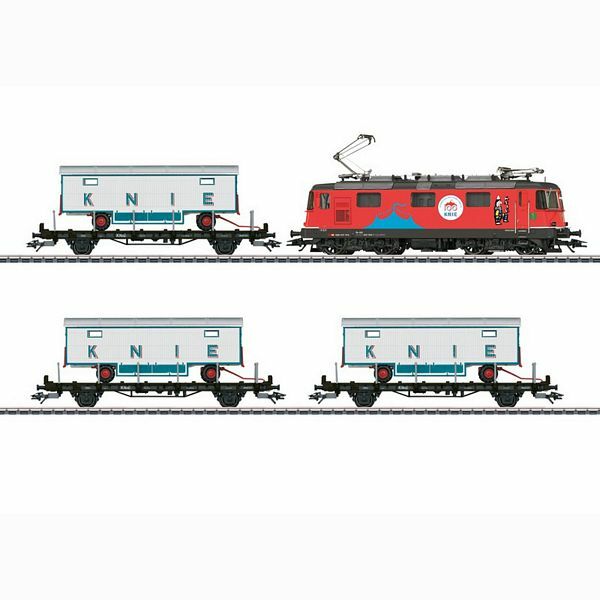 The couplers can be replaced by end skirting included with the locomotive. Three (3) circus wagons constructed of metal are included. Stakes for the flat cars are included for mounting on the cars. Total length over the buffers 62.8 cm / ??". 100 Years of the Swiss National Circus Knie. "World of Operation" mfx+ digital decoder with extensive light and sound functions included on the locomotive.